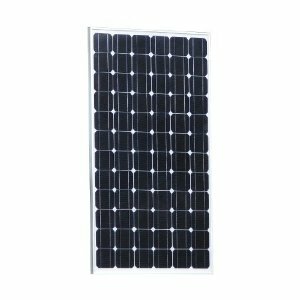 The AKT-140-M Solar Panel Kit is an excellent panel for people looking for a cheap and simple way to enter the world of solar power. This 12 volt, 140 watt monocrystalline solar panel comes complete with a 10 Amps charge controller and 5 metres of flexible solar cable. The panel is water resistant and sealed against the elements making it ideal for use on a roof or in the garden to provide free solar power for powering the home or as part of an “off-grid” solar system not connected directly to the utility grid. What makes the 140W AKT Solar Panel Kit perfect for home use is that it is made using 72 long-lasting, high-efficiency, 125mm x 125mm monocrystalline photovoltaic cells arranged into a 12×3 + 12×3 configuration designed to give free solar power over a 25 year period. In addition, this 140W AKT Solar Panel comes complete with its own 10Amp solar charge controller which incorporates built-in LED’s to indicate charging, output and battery capacity, designed for charging 12V battery systems without disrupting your existing power supply and 5m of high-current solar cable and fully waterproof junction box allowing you to connect it with other solar panels to create higher voltage solar arrays. On it own, this complete kit is all you need to fit solar power to your caravan or motorhome. The solar panel is one of AKT Solar’s range of top-quality panels currently available which guarantees over 90% of full power after 10 years of continuous use, and over 80% of full power after 20 years of continuous use with some of the highest solar panel efficiencies in the marketplace, all at affordable prices. You will find this 140 watt MCS certified solar panel cheapest on sale at Amazon through this link right here. This voltage optimised 140 watt solar panel is ideal for use in powering ON or OFF grid solar power systems and for charging 12V batteries. It’s rigid anodised aluminium frame and toughened 3.2mm tempered glass prevents damage due to frost, snow and high winds giving it a design life of over 25 years of consistent free solar power. The 140W AKT Solar Panel Kit is designed for ease of use and contains all you need to fit solar electricity to a 12V battery system such as in a caravan or motor home. Built-in bypass diodes minimise the impact of shading while its simple components and clear instructions make it a doddle to wire up. Top of the range 140 Watt AKT Solar Panel with excellent performance even in low-light conditions. High cost of kit compared to others. This 140 watt solar panel kit is currently on sale on Amazon through this link right here. This high quality waterproof 140 watt AKT solar panel is ideal for people who want to save money on their electricity bills and the environment, or were it would cost too much to install electrical cables to a shed or outhouse. This 140 watt panel is powerful and enough to be used to power hundreds of devices that you may use in a shed, boat or caravan such as lights and pumps and is capable of generating free renewable solar power even on a dull or cloudy day. For off-grid charging of batteries as in a caravan, camper van, boat or remote house type applications, why not connect the 140W AKT Solar Panel together with other 140W AKT solar panels to form larger arrays of many kilo-watts producing a higher voltage or greater battery charging current. The following table gives you an idea of what is possible with this versatile 140W panel. For example, 4 off AKT-140-M solar panels panels connected in series would give maximum operating voltage 70 volts (4 x 17.5) at 8.0 amps ( Vmp x Imp = 70 x 8.0 = 560W ). Likewise, 4 off AKT-140-M solar panels connected together in parallel would give 17.5 volts at 32.0 amps ( Vmp x Imp = 17.5 x 32.0 = 560W ). It is always better for circuit design and installation to connect together high wattage solar panels such as this AKT-140-M to give a higher voltage and lower current configuration. 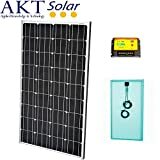 The AKT Solar and CE logos assures the build and quality of the panel, so for more information, customer reviews about this 140W AKT solar panel kit, Click Here to visit Amazon, you won’t find it cheaper anywhere else. Free shipping is also included.